Other clear aligners are nothing like Invisalign. First of all, Invisalign does not require as frequent a visit to your dentists’ office. With tried and tested material, Invisalign has perfected a system designed for your teeth that work to your best benefit. This true fit provides the advantage of not needing a checkup until four to six weeks. Invisalign is also built to handle, treat and perfect complex cases. In addition to that, it is made with their trademarked “Proprietary SmartTrack” material that makes tooth movements easier to monitor, control, and predict. More importantly, Invisalign is tried, tested, and trusted by of dentists all over the world, making it easily accessible, especially from dentists in Elkins Park, and the Philadelphia area in general. This means that many more dentists have the skill and know-how to properly choose, fit, and checkup on your progress on your journey to a better, straighter smile. Above all else is the value you get when you choose Invisalign. In most cases, your aligner changes every week, meaning your progress improves weekly. For teens, it’s even easier – there are indicators that change from blue to clear with wear, showing when your teeth are ready for the next set! Choosing Invisalign means perfecting your smile, and boosting your confidence. With other clear aligners what you save with the initial cost, you sacrifice in quality, and oftentimes it ruins instead of saving your smile. 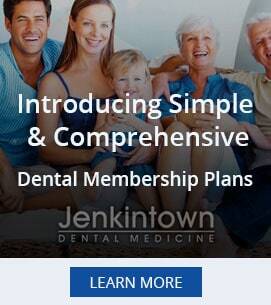 Talk to the professionals at Jenkintown Dental Medicine and find out how you can benefit from Invisalign.